I'm one of those weirdos who thinks badly xeroxed zine layouts and amateur art are features rather than bugs, so I'll be checking this out. I actually miss the old zines, like Trollcrusher and Underworld Oracle, immensely. They provided a chaotic wealth of ideas that professional magazines, such as The Dragon and White Dwarf didn't. At least I stole a lot more ideas from them, then I did from any other source. It's probably because they were generally based on people's actual campaigns, so there was a life to them, which wasn't really reflected in the mainstream magazines. 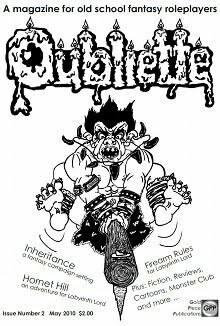 > Oubliette has a strong -- and admirable -- "fanzine" quality to it, which is to say, you can almost literally feel the enthusiasm of its creators while reading it. "Dragon" didn't have a demise...or if it did, it rose, phoenix-like, from the ashes in PDF form. It is, however, glossy, full-coloured, slick and quite possibly soulless. But I can still read it on my iPhone. Sorry Shane, Dragon died for me circa 1984. I'm glad you still get some use out of it, though (really). And I've got my old issues, so I guess we're all okay. Thank you for such a detailed and positive review - it has made my day. I said in my editorial of Oubliette Issue 2, that feedback can galvanize creativity. Thank you for providing myself and my team with this excellent catalyst for Oubliette Issue 3. I wasn't doing much at work, and RPGNow and it's afilliates are one of the few game related sites we can access. It was worth the money, I'm enjoying working through them. God some good ideas and inspirations.